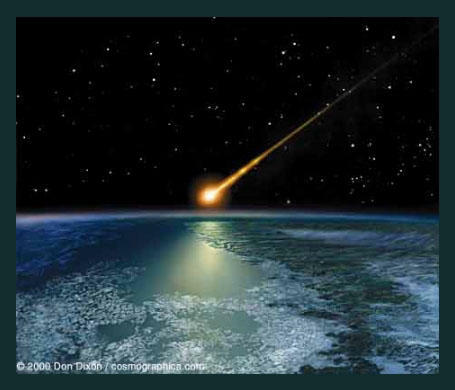 every year, during the four weeks between July 23rd and August 22nd, the Earth returns to the same place in its orbit that intersects with the tail of the comet Swift-Tuttle. with the clockwork regularity that duped Newton into thinking he could explain it on the basis of the same mechanical principles, it happens that, on the nights of the twelfth and thirteenth of August, every year, we pass through the densest part of this cloud of cometary material that is spread out in actual space over many millions of kilometres. at a combined relative speed of 132,000 mph, even the tiniest smidgen of dust makes a vivid streak of light - a meteor - as it disintegrates, and the rate of impact of those individual motes which happen exactly to provide a collision vector rises briefly to a peak of around eighty per hour on those two nights. for want of a conveniently intervening atmosphere these variously sized particles of cosmic sand and gravel would impact the surface of this place we call home with a similarly craterous effect as happens on the Moon and Mars and, indeed, everywhere else except here. this annual meteor shower (or, in some exceptional years, 'storm'), as we call it - this random scattering of these previously sun-scattered cometary tailings across the path of the rotating Earth, and their consequent dissolution into those brief, streaking trails of incandescent gas by atmospheric ablation, helps feed, amongst the few thousand skywatchers such as myself who wait and watch in the silent darkness of our pre-dawn gardens, some deeply primitive appetite for that which no other experience can provide - gets nowhere remotely near providing - something that's best left inarticulated, unless we want to end up talking about mindless surrender to the terrifying scale of our contingency, or something equally prolix and ultimately meaningless. and it all happens in silence, an eery, dislocating silence that distinguishes it from any other comparable earthly experience. it's what the bad sci-fi filmmakers always shy away from - that these absolutely catastrophic explosive events in space - from stellar explosions to planetoid collisions to these screamingly ferocious, fiery meteors - make no sound. there's just this silent screech of light scratched shockingly against the blackness of the sky for a fraction of a second, barely long enough to register, and hardly ever in direct line of sight, since the odds against one's looking towards exactly that particular arc of sky that the trail is going to occupy at exactly the moment it happens are frustratingly high. seasoned meteor watchers are all too aware of just how big that night sky is, even though we have a rough idea which quadrant to concentrate our gaze on to give us the best chance of a direct sighting. more often than not, it happens just to the side of where the gaze is directed, and, in that fraction of a second that it takes to redirect, it's over. the darker the sky, of course, the less light pollution, and the more open the horizon, the better the view. I used to live near the top of a hill in the middle of nowhere, miles from the nearest town, and, on meteor shower nights, would take a sleeping bag out into the field behind the house and just lie down for the best show in the world. and sometimes, gazing up at that immense starfield, orientating myself only to the North Star and the hazy track of the Milky Way, I'd allow myself to succumb to the dizzying temptation to let go completely of the evidence of all of my senses apart from my eyes, and accept that I was no longer looking up, but down, into an infinitely deep bowl of blackness, filled with stars.